Last Christmas Rachael and I tackled this "project" for my knitting room. She posed for her picture, took my picture then helped me crop and color things in photoshop. 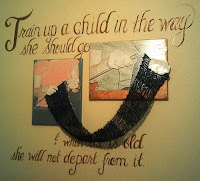 We painted the verse on the wall, mounted our photos onto canvas and hung them with the scarf i had knitted to connect the two .... and now, when i sit in my rocking chair tucked into the corner of my room, i see that precious verse and continue to whisper that prayer that the Lord has been hearing from me for the past 27 years! i had shown her the basic knit stitch several years ago, but life and friends and school pulled her attention elsewhere and it was tucked back in a far corner. However, once she picked up the needles the motion returned, and she was off and knitting with a simple little nudge of encouragement. 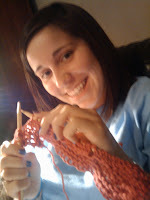 After a few rows i asked, rather meekly, if she was interested in learning to purl .. .ABSOLUTELY! and she was off again! it didn't take too long for her to decide that she was Ready for her 1st project .. .and it couldn't be 'just plain, straight knitting'!! !